Sometimes ads by Google are unintentionally funny. This example is at the end of an article by Ndomiso Ngcobo, discussing the response to the recent xenophobic attacks in Johannesburg. 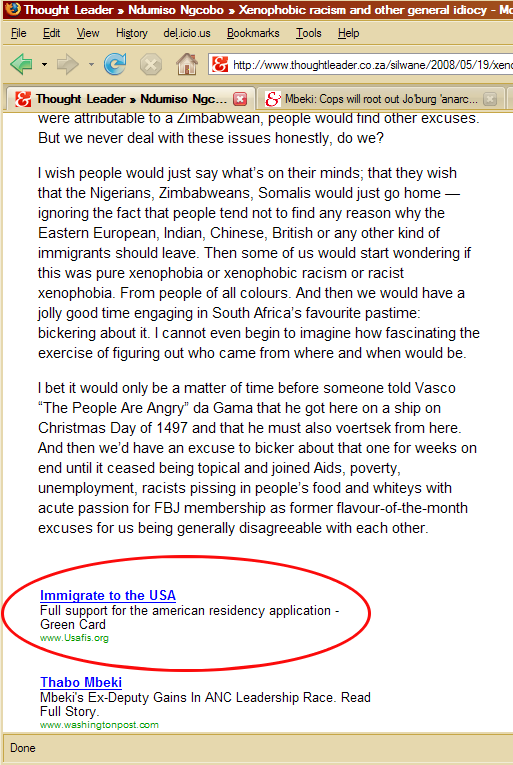 It seems Google Ads is suggesting that the refugees should have rather gone to the States, which is amusing on a number of levels considering the problems the States have with illegal immigration across their southern border. The advert at the bottom of my page when I read that article was a survey called ‘Is the UK racist?’ I have thoughts on that, clear ones, but I chose not to express them. But how did they know you were in the UK? The Googles knows too much and must be stopped before it is too late!! Dude, I know about the info one’s ip address give out. Pesky phorm and their data peddling evilness! Next Next post: Why haven’t you been recycling?